Rhubarb is a plant well known for its pinkish juicy edible leaf stalks. The motherland of this perennial herb is the Siberia; however, it is also spread all across the North America and Europe. This so-called ''pie plant'' is actually a vegetable that is extremely sour in taste, but also a bit sweet. Now that you know what rhubarb is, you might be wondering whether it has any beneficial properties. Rhubarb is a food rich in fiber, and therefore, is great for easing symptoms related to improper digestion. Researches have agreed that this plant aids digestion and eases discomfort solely by protecting the walls of intestines through the excessive secretion of gastrointestinal hormones. Since rhubarb is full of vitamin K, it's no wonder that it holds an important role in the metabolism of bones, and that it is partially responsible for the prevention of osteoporosis. Besides, vitamin K also strengthens bones and thus decreases the risk of fractures. Brain disorders such as a stroke, amyotrophic lateral sclerosis, and Alzheimer's disease, are all triggers of the oxidative stress. This type of stress oftentimes leads to the creation of free radicals, which are responsible for the development of various brain diseases and neuronal apoptosis. 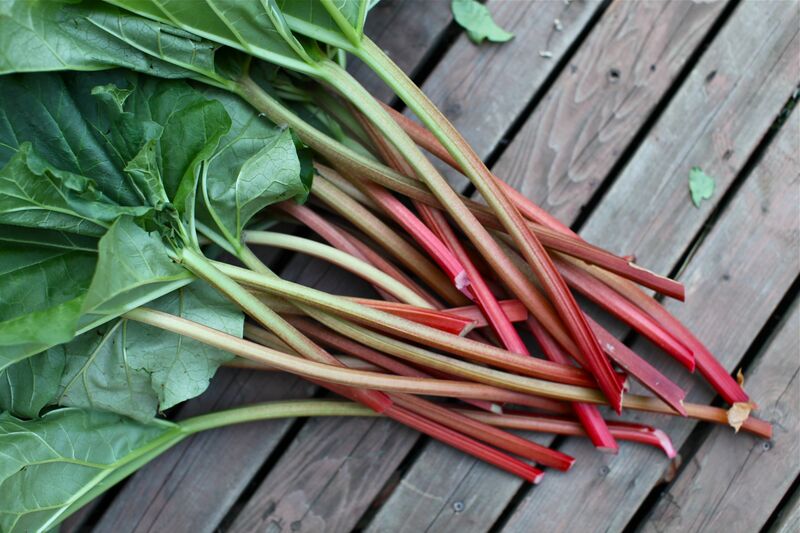 The extract of rhubarb protects the brain from this stress, which further ensures that it remains disorder-free. In addition to being full of vitamin K, this veggie is also full of vitamin A which is essential for keeping your eyes healthy. Rhubarb contains lutein, beta-carotene, and zeaxanthin as well, all of which are responsible for vision preservation. Whenever you find yourself spending some time in front of the computer, drink a rhubarb smoothie; your eyes will thank you for it. This plant is a great source of vitamin C, a vitamin responsible for immune system boosting. Naturally, immune system tends to become weaker during spring, so here's when rhubarb health benefits come into the picture. Include this vegetable into your diet to strengthen your immunity, as well as to help yourself feel and look much younger. Lycopene and anthocyanin contained in rhubarb possess the ability to lower the risk of a heart disease. Of course, if you are dealing with a lot of stress, eating this plant most probably won't help you improve your overall heart health. Curing high blood pressure with this herb alone isn't possible; however, eating it on a regular basis does help lower it a bit in the long run. Making a pie out of its stalks or adding some to your salad should do the job. As it is known, antioxidants have the capability to neutralize free radicals which can lead to cancer. Antioxidants, beta-carotene, and polyphenolic compounds like zeaxanthin and lutein, are all contained in rhubarb and are contributing to various rhubarb health benefits. Additionally, polyphenolic compounds have been associated with prevention of lung and oral cancer. Rhubarb doesn't contain a lot of iron and copper; however, the amount of those it contains is surely enough to stimulate the production of erythrocytes. Thanks to this, the red blood cells count inside of a body increases and the overall oxygenation increases with it as well. If you want your skin to appear younger, using this vegetable as a skin-care treatment might be a good idea. Nutrients that a cup of rhubarb contains are able to brighten the skin and stimulate the rejuvenation of its cells. They are even able to keep free radicals responsible for premature aging at bay, and thus give the skin that much-needed glow. Rhubarb can make kidney disease and gastrointestinal problems worse, so it is best for you to avoid it if you are suffering from any of these. Also, if you are growing this plant yourself, remember not to let your pets or kids eat the leaves as the oxalic acid contained in them could be toxic. Can You Eat Too Much Garlic?